When most people think of quilts, they think of traditional patchwork quilts, like Grandma used to make, that are used as a bedspread or blanket on a bed. Quilters, especially prolific quilters, often need to find other ways to use their creations and many quilts today are meant more for decoration than functional use. I've spent some very enjoyable time scouring the internet for some examples of quilts used in other rooms of the house to share with you. Enjoy! 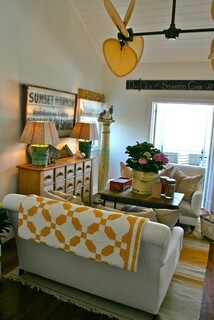 I love a quilt draped over the back of a sofa or loveseat. A quilt displayed this way is a great way to add a pop of color into your room. 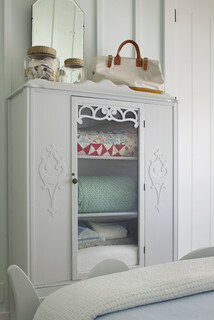 A glass front cabinet looks great with quilts and antique blankets stacked inside. 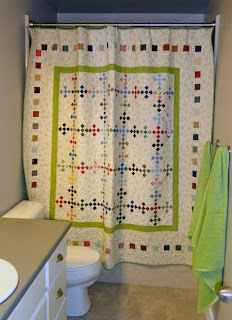 And quilts even look awesome in the bathroom. This one is used as a shower curtain. I'll be sharing more of these over the next few weeks, so stay tuned! I agree, quilts shouldn't be relegated to just the bedroom. I once made a patchwork shower curtain for a customer out of African fabrics. I would love to see a picture of that one. I love African fabrics! I also decorate my walls in my log cabin with quilts and switch them out to add color to my living room walls! In winter hang one of my very bright quilts and in summer a flower one just for a different change of mood!